Summer brings nice weather for all of us, including our four legged friends who like to run and play outside too. Unfortunately both dogs and cats can run out in front of cars or get into other trouble that may result in a broken bone. 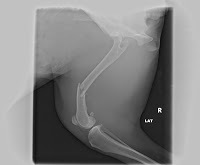 Long bone fractures are one of the most common orthopedic problems we see at MedVet. The most common bones to be fractured include the radius/ulna in the forelimb and the femur (seen here) or tibia/fibula in the hindlimb. There are several variables of bone fractures that may make prognosis better or worse. If the joint is involved in the fracture, then osteoarthritis of that joint is highly likely after surgery, even if it is stabilized. Young animals can fracture through their growth plates, which may cause deformities as they heal. Also the bone may come through the skin, which is termed an “open” fracture and has a higher risk of infection than one where the fractured bone ends are contained within the muscle and skin. 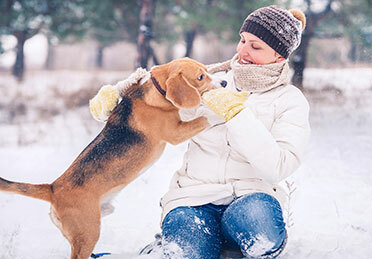 Young animals typically heal faster than older animals, which is great, unless the fracture is not identified until several weeks after the fracture occurs and the bone heals in an abnormal location. Fractures can be fixed by multiple methods and one repair doesn’t work for all fractures. The most common repair is by plate and screws. The following pictures show the repair of the fracture above using this method. To add stability and help prevent bending forces, a pin was also added down the center of the bone. 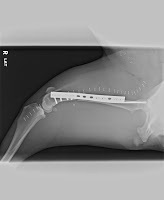 Animals can keep plate and screws for their entire life if they don’t develop an infection or loosening of the implants. Another unique repair is called an external fixator, which places most of the hardware outside the leg, as seen in this picture. 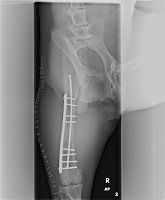 When the fracture heals, the fixator is removed, which also removes all the implants. This type of repair is excellent for open fractures that are infected so the implants can be removed and will not harbor that infection. The downside to this method is the cleaning of the pin tracts and weekly checks of the fixator to make sure it stays tight. Most orthopedic implants are stainless steel, but titanium is also used. Other types of implants include: interlocking nails, pins, screws, or pins and wire combination. Most fractures heal within 8-12 weeks. 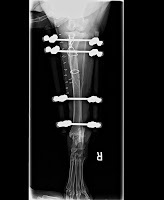 If animals are less than 1 year of age, fractures can heal within 4-6 weeks. Rehabilitation in an underwater treadmill in the early period after surgery is recommended. This type of therapy encourages use of the operated limb so the patient can maintain range of motin and muscle mass without having to bear as much weight.